Lightweight. Functional. Ready to travel. Whether you’re going to church, heading to work, or touring the globe, the NIV Thinline Bible is ready to go with you. Its size makes it easy to keep God’s Word at hand, no matter where life takes you. The NIV, Thinline Bible, Bonded Leather, Black, Red Letter Edition is the perfect Bible for travel. I absolutely love that it's thin and fits in my purse, diaper bag or suite case with ease. 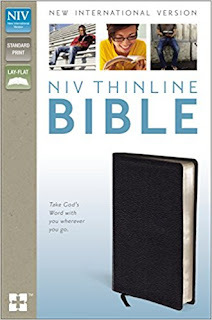 The NIV, Thinline Bible, Bonded Leather, Black, Red Letter Edition is a terrific Bible to take with you wherever you go. It's less than one inch thick but still contains the complete Bible with the words of Christ in red. It also has a presentation page which makes it perfect for giving. 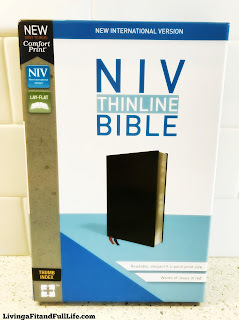 The NIV, Thinline Bible, Bonded Leather, Black, Red Letter Edition is a terrific Bible and I highly recommend it! You can find NIV, Thinline Bible, Bonded Leather, Black, Red Letter Edition on Amazon, Barnes and Noble and other bookstores.